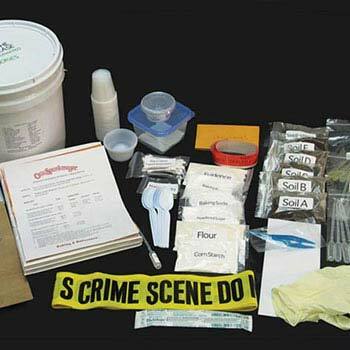 Case Of The Missing Mascot: A Crime Scenario, Forensic & Crime Scene Kits: Educational Innovations, Inc.
Who took the school mascot? Students must try to discover the culprit before the Big Game! 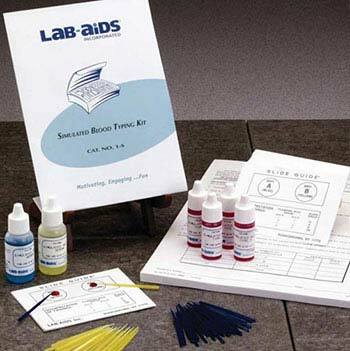 Activities include fingerprint and bite mark analysis, fiber flame test - even DNA analysis! Comes complete with all the evidence, full teacher guide on CD, student printables, and enough materials for 30 students to participate. Even has information on staging your own trial! Designed to be used over five days, one class session per day. Can be extended beyond the five days to include the trial. Disclaimer: I'm a parent volunteer who is a bench scientist at a university and so your experiences will be different than mine. I go into my daughter's classroom and do science a couple of times a month. 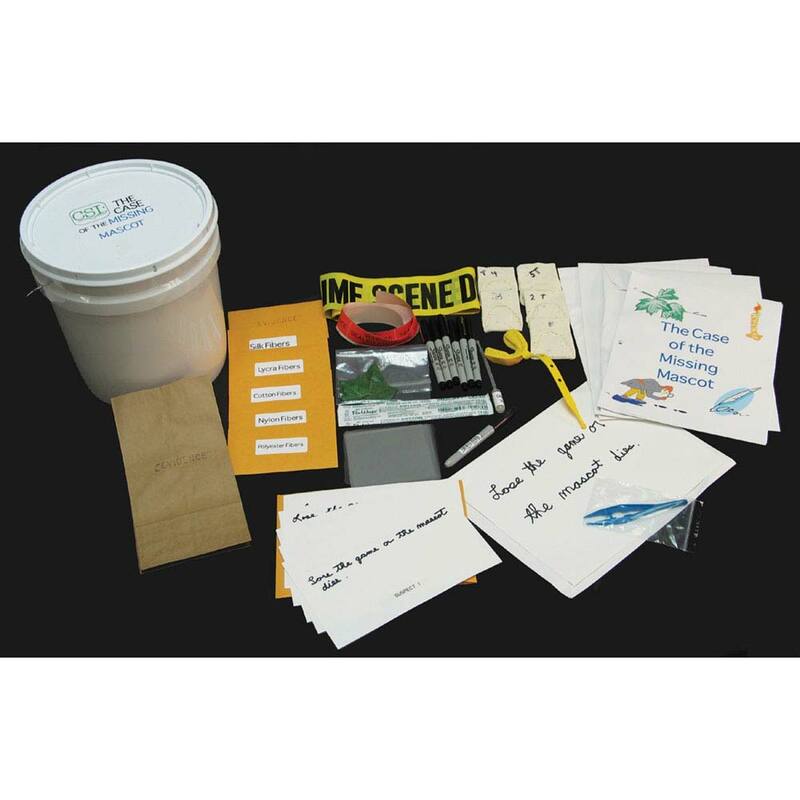 We decided that we'd try this forensic science kit, since it seemed to cover many topics they were going to go over in 6th grade, specifically using evidence to back up statements. 1. The kit write up is very complete. We didn't have to concern ourselves with finding more info. However, it's from 2004 and is now dated. Specifically the bite mark section. 2. The kit skimped on some materials. We were expected to compare fiber samples to the unknown but each sample of cloth was about 3X3. Because we had such small samples, the comparison took a long time. The fingerprint section only had one ink pad, and so fingerprinting the class took over a half hour and we were pretty sloppy about it. 3. The kit advertised itself as being reusable with a refill kit. However, we ended up breaking several of the tooth molds in just light handling, and so I will not be able to reuse the kit. 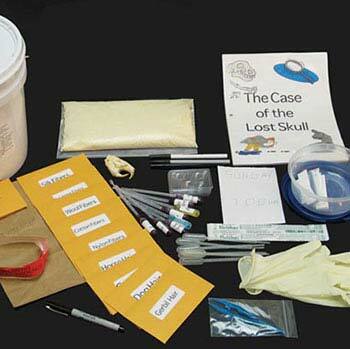 The kit itself had several different kids of "evidence" left at the scene of the crime and the coolest part was a mouthguard with real tooth impressions. This was to be matched up with the suspects teeth impressions in clay (which as indicated above we ended up breaking simply by following the directions). The kit also had extensions into math, writing, etc, and the write up was very good. 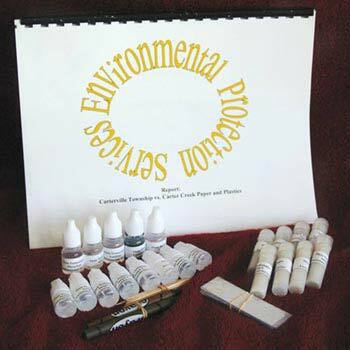 I have given the kit 4 stars because it was of a high quality and did come complete with everything we needed, but I felt it could have given more than one ink pad (since they are around $3 a piece), larger pieces of cloth, and the clay tooth impressions are now broken, so I can't reuse the kit, even with the refill. Owner Response: Thank you for the in-depth review. I have sent your comments to the manufacturer to see if they can update the manual and to give input on their kit.